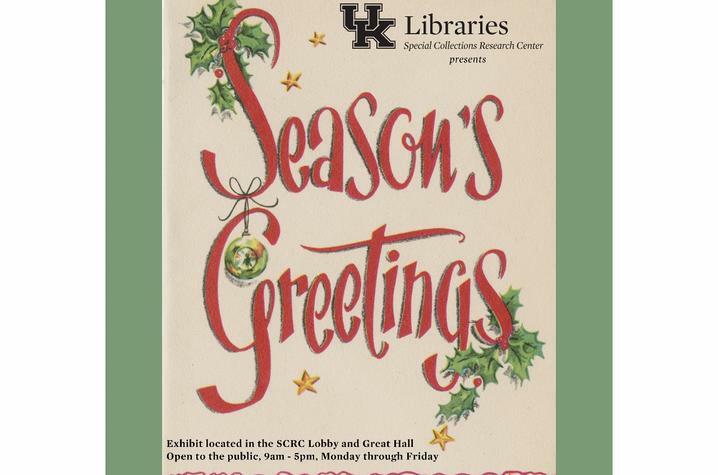 LEXINGTON, Ky. (Dec. 10, 2018) — See how people of various faiths and cultures wish tidings of joy during the holidays with “Season’s Greetings” presented by University of Kentucky Libraries’ Special Collections Research Center (SCRC). The free public exhibition is on display through January, in the lobby and Great Hall of the Margaret I. King Library Building. A study break will be presented in conjunction with the exhibit Dec. 12. “Season’s Greetings” features holiday cards, newspapers, prints, artwork and other items related to Thanksgiving, Christmas, Hannukah, Kwanzaa and New Year’s celebrations from the collections of the SCRC. The exhibition includes both prints and original materials. 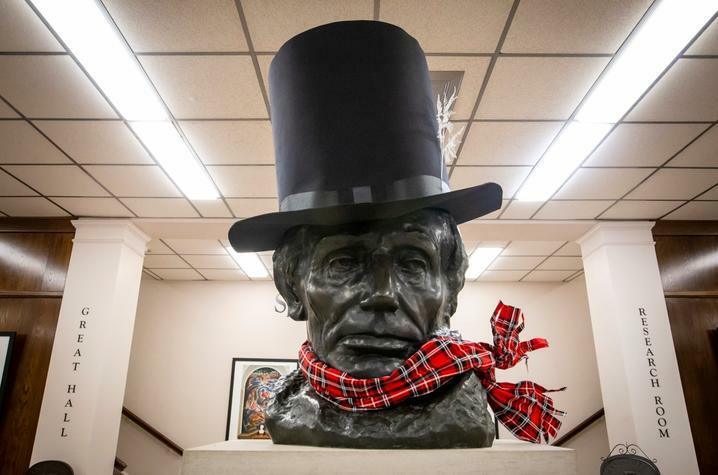 To celebrate the season and exhibit and offer a welcomed break during this busy time of the school year, a study break will be presented as part of “Season’s Greetings” 10 a.m.-noon Wednesday, Dec. 12. Coffee, cider and cookies will be available to students in front of King for those interested in visiting the exhibition. In addition, the Great Hall will also be open for those looking for a quiet study space 9 a.m. to 5 p.m. Monday through Friday during finals week. The SCRC at King is open 8 a.m. to 5 p.m. Monday through Friday. For more information on the exhibition, contact Matthew Strandmark, education archivist at UK Special Collections Research Center, at 859-257-1949 or mstrandmark@uky.edu. SCRC at UK Libraries sustains the Commonwealth’s memory and serves as the essential bridge between past, present and future. By preserving materials documenting the social, cultural, economic and political history of Kentucky, the SCRC provides rich opportunities for students to expand their worldview and enhance their critical thinking skills. SCRC materials are used by scholars worldwide to advance original research and pioneer creative approaches to scholarship. UK Libraries SCRC is the Archives, the Louie B. Nunn Center for Oral History, the King Library Press, the Wendell H. Ford Public Policy Research Center, the Bert T. Combs Appalachian Collection, the John G. Heyburn Initiative and ExploreUK.